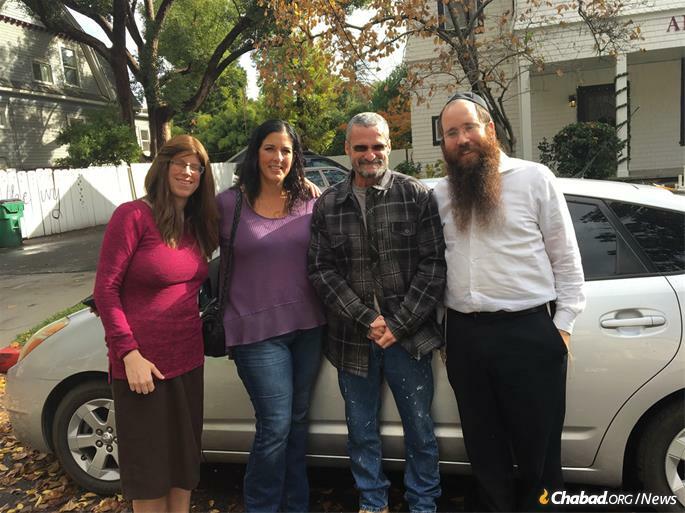 Rabbi Mendy and Chana Zwiebel (right and second from right), co-directors of Chabad of Chico, Calif., have launched a program to provide used cars in sound working condition to victims of the Camp Fire with a demonstrated need for transportation. When the Camp Fire started in Butte County, Calif., Rachel Begbie and her husband, Paul, were recovering from a severe accident they’d had while on vacation a few weeks earlier, trying to mend from several broken bones and Paul’s jaw, which is also broken and wired shut. Since the fire, which claimed 85 lives, and destroyed nearly 14,000 residences and about 5,000 other structures and businesses, the couple has been shuttling back and forth between Rachel’s sister’s home two hours away and a friend’s home in Chico in the car they evacuated in, which isn’t in great shape. Paul and Rachel now have to do everything together, juggling their physical recoveries and numerous doctor visits with going to the disaster centers to file for federal aid, to seek reimbursement from their insurance company and more. 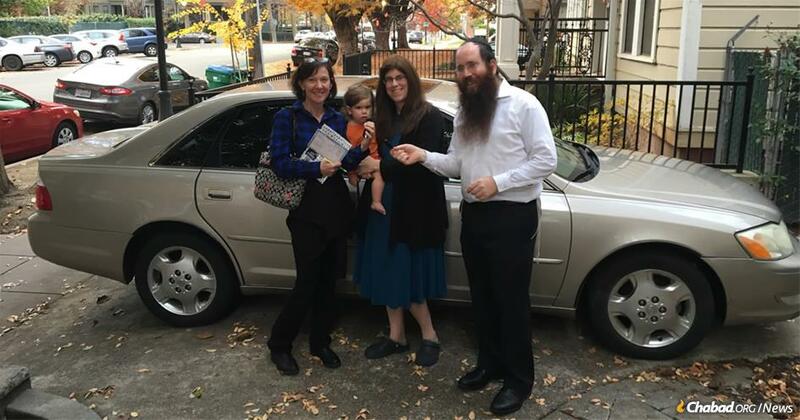 On Tuesday, the Begbies got a gift that is already giving them a significant sense of independence: a used car (new to them, though), thanks to an initiative by Chabad of Chico, Calif.
Chabad of Chico in Northern California is continuing its efforts to provide assistance to people who lost their homes in the deadly Camp Fire that decimated the town of Paradise and has gone on record as the most destructive wildfire in the state’s history. 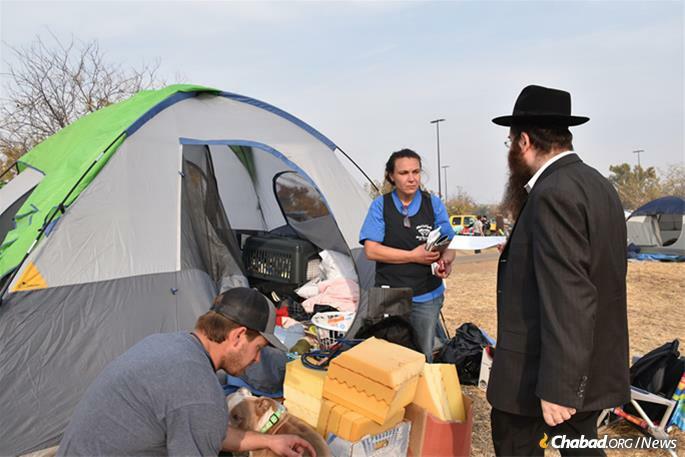 The car giveaway is one of a number of initiatives that Chabad of Chico has spearheaded in the wake of the fire that claimed 85 lives, and destroyed nearly 14,000 residences and about 5,000 other structures. 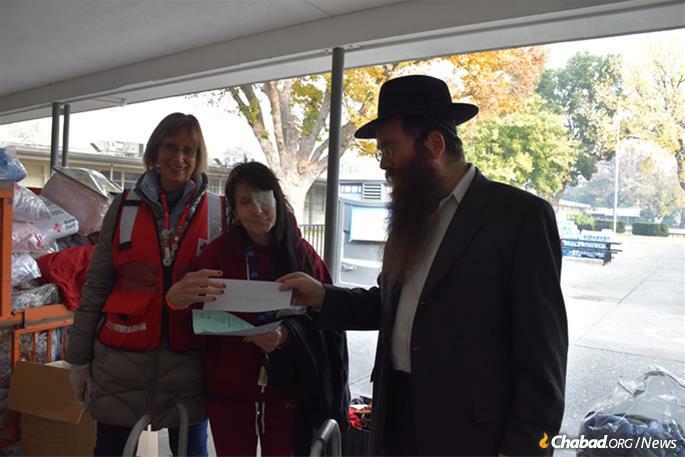 The car giveaway is one of a number of initiatives Chabad of Chicos has spearheaded in the wake of the fire. To date, Chabad has distributed upwards of $15,000 in financial aid. And the Zwiebels, assisted by an army of volunteers, have cooked and delivered hundreds of homemade meals for people in need, and are currently running a holiday toy drive. Among the first to get one of the donated cars was a man whose grown son has brain cancer and needed a vehicle to take him to medical treatments. The hospital where his son was initially set to be treated was in Paradise; it burned down in the Camp Fire. Delvering aid to the needy in outdoor camps. Meanwhile, Rachel Begbie hopes to be able to help others one day the way her family, friends and Chabad have helped her. To donate a car or otherwise assist victims of the Camp Fire, go to the relief fund page here. 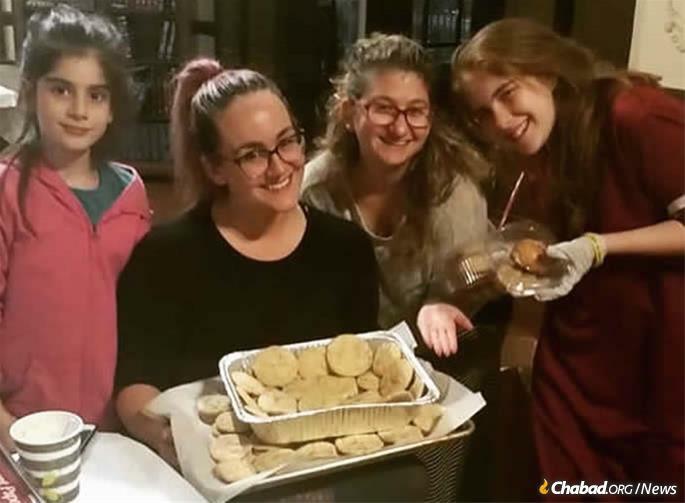 Home-baked goods and communal warmth have been a help to the many people who continue to stop by the Zwiebel home and Chabad center. The fire has left thousands with no place to live and no employment, as so many local businesses are gone.